One of the World’s largest Owls, the Great Grey Owl is dark grey overall interspersed with bars and flecks of light grey and white. The feathers of the facial disk help direct sounds toward the ear openings that are hidden by feathers. 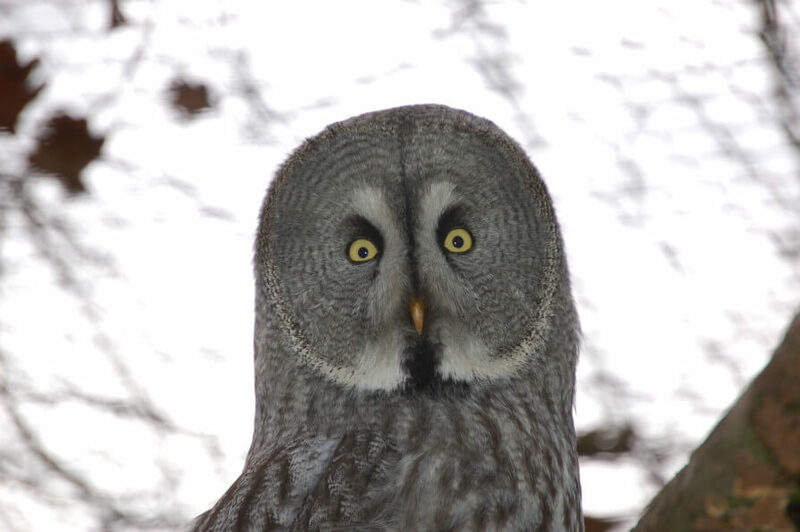 The Great Grey Owl is 60-83 centimeters high, with a wing span of 137-152 centimeters. Habitat: Great Grey Owls inhabit a range of forested habitats ranging from coniferous forests along the Arctic treeline to mixed conifer forests in the Sierra Nevada Mountains. Population: Not threatened or endangered. Lifespan: Captive owls may live up to 40 years of age. Diet: Although a very large Owl, small rodents are their primary prey (80 to 90% of diet). Other mammals taken include rats, mice, shrews, squirrels, rabbits, chipmunks, moles, and weasels. Behaviour: These Owls are active at night, but also at dusk and just before dawn. They fly with soft, slow wingbeats and generally do not often move more than short distances between perches and seldom glide. They fly close to the ground, usually less than 6 metres (20 feet) up, except when flying to a nest.